It's ridiculous. Last night when we were moving into our new place, it took my husband exactly ten minutes to unpack and hang up all his clothes in his own closet. Meanwhile, two hours and two closets later, my husband finally came around to ask me if I needed help. "Well, I'm almost done, but you can grab a couple more hangers for those shirts." "That's not the kind of help I meant," he looked down his nose at me, through knitted brows, in the way only a husband, who is getting ready to call the psychiatric hotline, can do. I knew he was right. 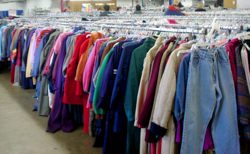 After all the time I've spent in developing countries, I felt sickened by the greed snickering at me from my closet. How did this happen? How many black shirts (and shoes) does a person need? How did I manage to acquire enough duds to clothe Haiti? I can tell you exactly how it happened: Trips to Goodwill. I swear, they put a spell on you in those stores. Especially the one in Rochester, Minnesota, a community brimming with medical money. It is so amazing to shop there, and it's so easy to rationalize that, since I'm saving so much money on these expensive wonderful clothes, and also since I'd never be able to afford clothes like this new…hey, why not buy them all? And so, sporting a new/used extra large duffel, I brought Goodwill home. But in my heart, I knew I didn't need all those clothes. I knew I was choosing against the nudge of the Holy Spirit who told me not to overdo it at Goodwill. And last night, with the evidence mounting against me, I finally had to admit it. My will took over at Goodwill. I noticed something interesting on this topic just tonight, while studying for an upcoming event. In Isaiah 14:13-14, God describes a person's fall (possibly also a picture of Satan) and how he said out loud three times, "I will…" Contrast that to Jesus. Matthew records Jesus saying three times out loud, "Your will" (Matthew 6:10, 26:39 & 42). Indeed, any rebellious person (or being) follows his own will, while Jesus, as a perfect example, followed His Father's will. And there is all the difference for our lives through these two examples. Sin is the result of the lost battle between my will and God's will. When we desire to live for God in obedience (which results in freedom), we will do the will of the Father. When we desire to live for ourselves (which ends up the worst of captivity), we will follow our own will. I'm definitely feeling the control my two closets have over me right now. It's like a burden instead of a joy, owning all those clothes. 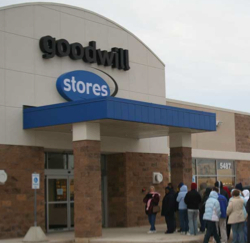 So, I guess pretty soon, it's time to make my way back to Goodwill to follow God's will, leaving the clothes on the racks for someone else who needs them more. Hey, Good to see you still got it. what do you suspect gonna happen next? What your saying is completely true. my friends as I agree with most of what you’re saying here . I know that everybody must say the same thing, but I just think that you put it in a way that everyone can understand for http://www.cashadvance-loans.us I honestly believe there is a skill to writing articles that only a few process and frankly you have it. I wanted to thank you for this interesting เกมส์ definitely loved every little bit of it. I have you bookmarked your site to look at the latest stuff you post. Thanks for your nice post.Staubsauger warentest : Best-Shop können Sie Schlüsselwörter mit allen Marken zu finden und sparen Sie Ihre Zeit beim Einkaufen mit unserem Vergleich die Preise und Kunden-Feedback. now its time to learn computer at home. checkout this best resource on computer tutorials. Thanks for the information. I am a bit more educated after reading this. :). Continue posting, please. Now I’m goind back to my work, the boss is approaching :). Take care! I like this post so much . But so busy now bookmark this page for read later thanks . Excellent publish.. right once haggle of search I found this publish, am extremely glad to you for this info. 1 time after I had been bored and faraway from place in my chair, I came additionally stumbled upon here, additionally boy the uninterested and out of location feeling was gone correct away, your post is that sensible. Thank you all very helpful article. Thanks for your personal marvelous posting! I definitely enjoyed reading it, you are a great author.I will ensure that I bookmark your blog and may come back from now on. I want to encourage continue your great work, have a nice day! Thanks so much for providing individuals with a very wonderful chance to check tips from this website. It really is very terrific plus full of amusement for me personally and my office mates to search your site a minimum of 3 times in a week to find out the new guides you will have. And of course, I’m at all times amazed with all the striking strategies you serve. Some 1 tips in this posting are without a doubt the most suitable I’ve had. OUR BEST TUNER EVER! This Eno clip on digital chromatic guitar tuner features a vibration sensor that enables accurate tuning of your guitar bass or violin.Fast & easy shipping. Huge selection.Order now and save! Especially liked this blog post, keep it up. This is a good, common sense article. Very helpful to one who is just finding the resouces about this part. It will certainly help educate me.thank you very much. I understand everyone's got their own opinion, but really? Listen, your web log is cool. I like the efforts you put into it. Thanks for fantastic info I was looking for this information for my work. The article was very good. I will be coming back to your blog again.